My big message in school presentations (and wherever someone is listening) has always been: visual literacy is possible and available to everyone, no talent or golden ticket required. And yet, today’s art teachers and classroom teachers tend to skip the observational drawing and painting process in their lessons, even in arts-infused settings. Why? It is in part due to the tremendous pressures on art teachers to connect with the school curriculum in order to remain relevant and continue to be funded. Consequently, art teachers have developed a whole bag of trick to decorate hallways and refrigerators, to keep people connected to what they are doing. But is making sponge prints of butterflies or foil embossing really serving the kids? It’s fun but is it making us any smarter? The ability to draw what you see is empowering. It is a tangible manifestation of your ability to see and interpret nature. Gives you a sense of accomplishment and builds self-esteem. Observational drawing is about seeing deeply. Seeing deeply requires focus and concentration. Drawing is about making connections, not only between shapes and colors but between ideas. Focusing on drawing teaches children to understand and appreciate the world around them. It brings us closer to God and reveals nature. Nature is not black and white. It is incremental. Things are not always what they seem. It teaches empathy, sensitivity and nuance. Teaches you to see subtle gradations in color and value. Drawing, which is a celebration of how things are connected and interrelated, makes synaptic connections in the brain that lead to higher learning. Our subjective response to what we see leads to the creation of new experiences which empowers creativity in ourselves and others. Comparing and contrasting what they have drawn to what they observe leads to new ways of seeing, evoking a story, which stimulates the writer in everyone. Teaches discipline, concentration and focus. Teaches us how to be free within specific structures. It teaches you to find creative solutions to problems, forcing us to have to break things down into manageable parts. Teaches the value of repetition in learning; drawing requires practice. Teaches us how to see things as they are, not how we think they are. We learn that there are no patterns in nature; learning there are no two shapes alike in nature is expremely profound. Teaches management of time and materials. Proportion is math, composition is geometry, which prepares your mind for higher mathematics. Girls (guys) dig those who can draw and paint. Drawing well is a great way to impress friends. Sketching your friends or exhibiting your work makes you the life of any party. Artists are cooler and often more popular than civilians. At one time artists were considered the enlightened ones among us (and still are by many!). You’re art is a tangible reminder of the experience you had creating it and the work you create is part of you life’s legacy. People want to own your art because it reminds them of you, themselves AND the idea/subject you painted. Aspects of drawing and painting can be tedious, which teaches you how to do what what’s good for you instead of doing only what you want. Art is the great equalizer and demonstrates diversity, teaching us how to see through others’ eyes and not just our own. The process of making art is deeply rewarding and satisfying in and of itself, even if no one ever sees it. Helps you identify your unique style and tastes in art and life. The gift of art is the most personal gift you can give another. The materials are cheap compared to the potential profit if you are committed. It makes you look smart and talented and “deep” when you can make art that moves, touches and inspires. Teaches the value of work and perseverance. Gives you measurable, achievable goals. Gets you into better schools, sometimes leading to scholarship opportunities. Allows you to express your feelings in acceptable ways. Teaches compassion and raises your capacity to love. Artists have their own secret language. 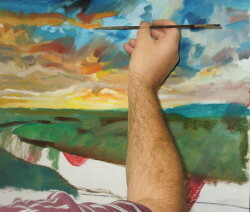 Artists have thei8r own community and clubs, which help you meet like-minded friends. As an artist you get to do exciting things like travel. If you dedicate yourself to your art you can get paid to do what you love. Having a mission gives you purpose in life. Feeling and expressing with paint makes you human. Painting is a primal experience; it’s like playing in mud. Gets you out of the regular classroom. You are part of a fellowship of fellow artists wherever you go in the world. You possess secret knowledge. You are part of and passing on a sacred and ancient tradition. You can entertain yourself with no one else around. It’s a great way to get away from it all. Drawing and painting are endlessly challenging, so you need never be bored. Sue Kingery Woltanski liked this on Facebook.